In 21st century, the functional annoatation of sequence data generated from human genome project is a major challenge in front of a scientific community. Since functions are closely related to subcellular localization, hence determination of subcellular localization of a protein can assist in elucidating the functions. 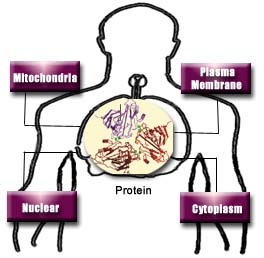 Hslpred is a SVM-based method for the prediction of 4 major subcellular localization (cytoplasm, mitochondrial, nuclear and plasma membrane) of human proteins using various features such as i) amino acid composition, ii) dipeptide composition and iii) evolutionary information of proteins. The overall prediction accuracy of amino acid composition, dipeptide composition, and similarity based SVM modules is 76.6%, 77.8%, and 73.3% respectively. To encapsulate more comprehensive information, hybrid module based on amino acid composition, dipeptide composition, and PSI-BLAST output was also constructed and achived an overall accuracy of 84.9%. User can select any of these feature based module for the prediction of subcellular localization of human proteins. Click DATA to obtain the data set of 3532 human proteins used to develop HSLPred. Aarti Garg, Manoj Bhasin, and Gajendra P. S. Raghava (2005). SVM-based method for subcellular localization of human proteins using amino acid compositions, their order and similarity search. J. Biol. Chem. 280:14427-32.